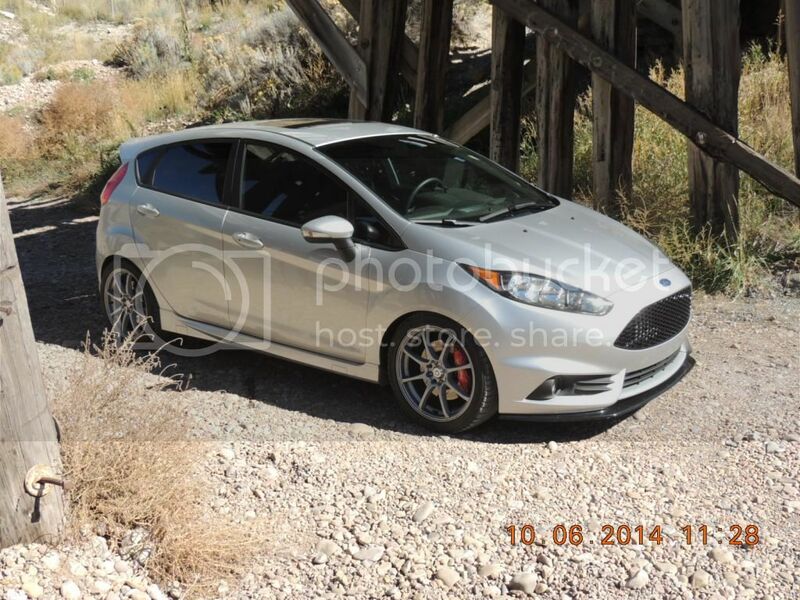 Please use this thread to post all Ingot Silver Fiesta ST pictures. anyways I decided to pick one up for myself. 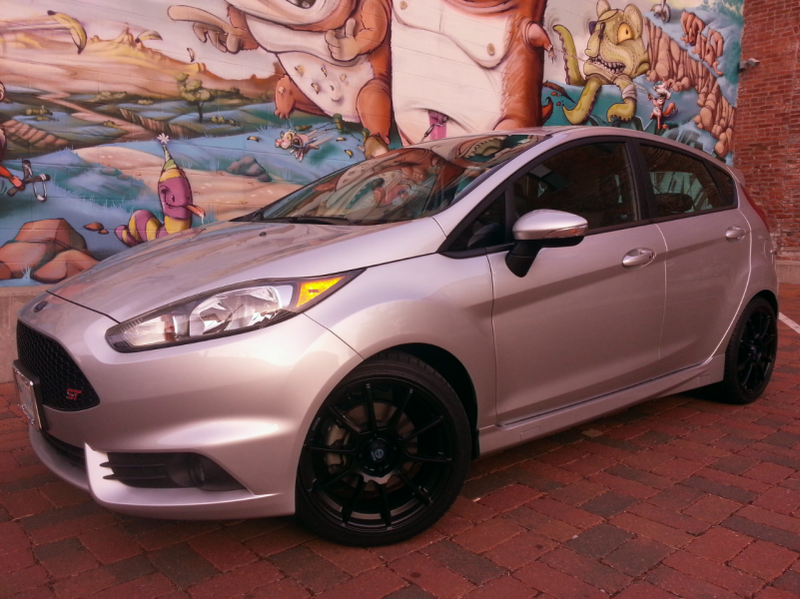 This is my Fiesta ST. Current mods are ATP downpipe, BC coilover suspension, Boomba shift kit and transmission bushings, Cobb Accessport, SVT EAP rims and a drop-in green filter. I have other parts that I am considering. Looks a bit different today, I drove to the city on my race tires and had 20% tint done all over including a windshield banner but darker on the sunroof. 2003 4Runner V8 AWD, best vehicle ever! I've always liked those SVT wheels and you make them look even better. 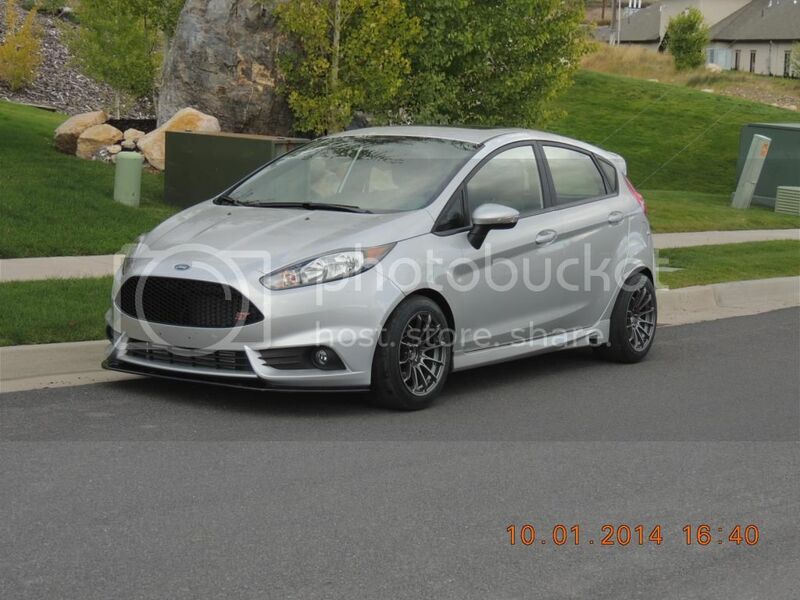 Granted mine won't be lowered but with a 45 series tire it shouldn't look too bad. Do you happen to see the other style of that wheel on tire? And what is your offse on those pro races? They look like they're poking like crazy! 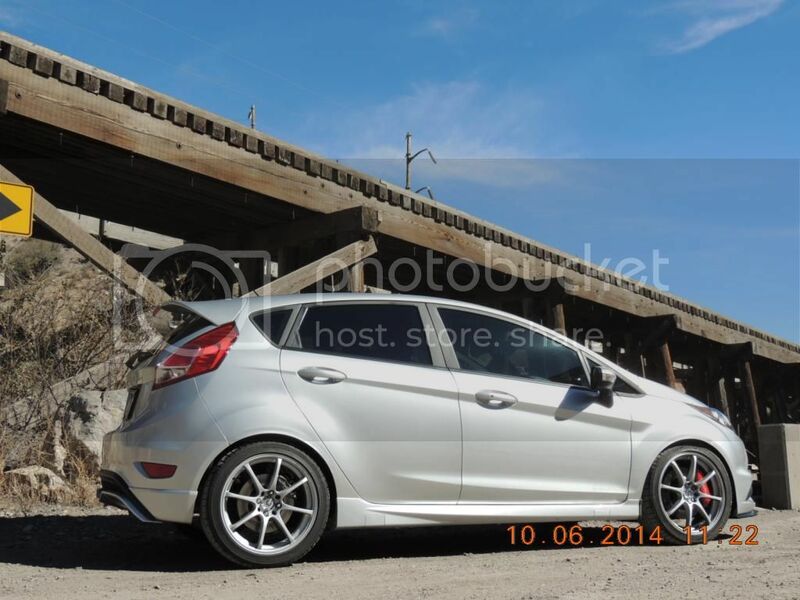 Those SVT wheels do look great, what are the specs on them, width, offset, weight? I have Konig Dial In, 15x9, 13lbs, roll formed, -1.5 rear, -2.5 front negative camber, rolled and pulled front, rolled rear fenders, the car is lower than it looks, the tires are not very tall, I might switch to the 245/50/15 RA1 DOT race tires instead of the 245/45/15 RA1 tires I have on right now. 4x100 bolt pattern change was one of the first mods I did so I could get cheap quality track wheels, roll formed which means very strong, for $126 per wheel! The 15x8 version is 12 lbs and around $119 or it might be $109 each. There are others available as well but some will not fit over my 11.75" BBK. I can only lower the car around 1/4" more in the front or will go past the optimum for roll center, something I would never do on a car built to go around corners. Not really a performance enhancer but I love the look of them. Especially if you get a 45 series tire to make it looked dropped a little more. With my street wheels before I paint them gunmetal. Noon is not the best time to take pics so I am pretty happy with these but will have to go back in the early AM or evening. I noticed the number when back home editing the pics. 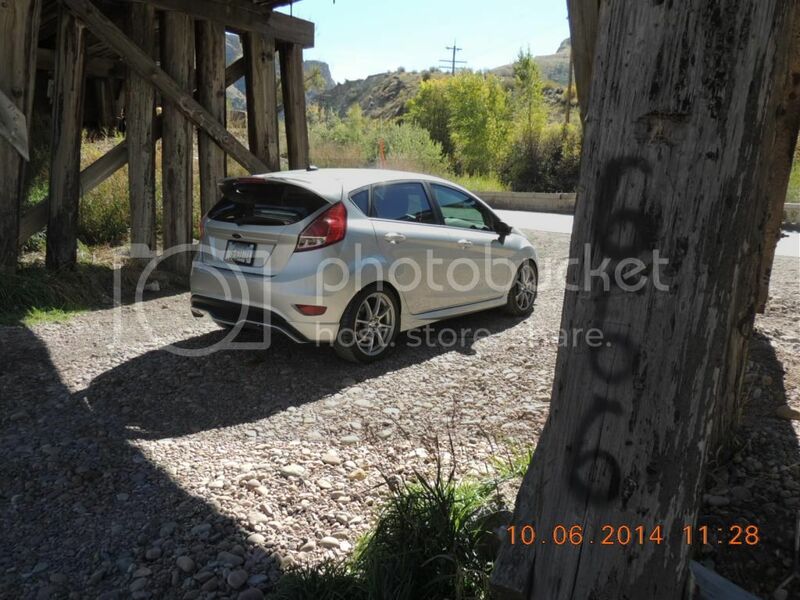 My other wheels in the prior pic shows the 225/45/15 Toyo RA1 DOT race tires on 15x9 wheels. What made you pick all season over a summer performance tire? I'm just debating on what my next set will be in the spring. I have my race tire and wheel setup and my all seasons which are top notch tires I can use if I show up at a track and it is raining. I will be traveling all over NA and on tracks all over as well where I will use the race tires unless to cold or wet then I will use the Mich AS which are as fast as some summer only tires in the dry and superb in the wet and or cold. That makes sense. I just don't know if I want the AS tires or summer tires. If you are going run autocross, want the absolute stickiest tires for mountain runs, doing track days, etc...then summer only tires are a great way to go but they wear out far faster than some very good all season tires. If you are going to drive the car in cold weather, really below 50 is cold on summer tires, not trying to win events, etc......then a great set of the top tier all seasons can give close to the grip of many summer only tires yet work really well in cold weather and the rain or even light snow. The lower cost brands have some good ones to pick from but if you get something like the AS3 Michelin they generally last far longer and are a bit better all around so really not more money or much more in the long run. You would have more grip more of the time with all season tires if you drive your car, all season. If you plan to run winter tires, which I have only had two sets my entire life and driven decades in the winter, then summer and winter can work but spring and fall can be compromising times, almost need three sets of tires. I find it easier to run great all seasons for everything but the track and then run dedicated track tires there. During the years in SoCal in the Navy I ran all seasons on the regular use vehicles and summer only or even DOT race tires on the project cars, even on the street. Depending what type of camera you are using, a polarizer filter will reduce glare and reflections from sunlight reflecting off of your car. 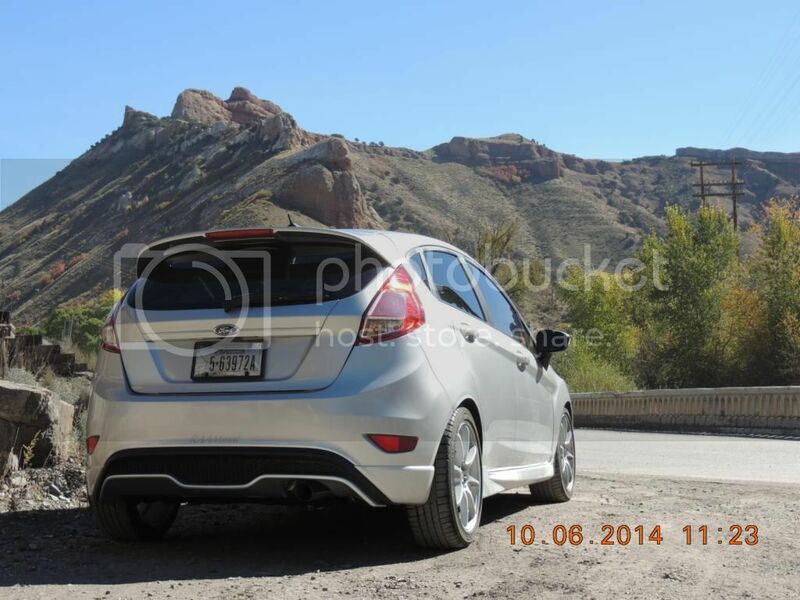 I use one on my Canon for water shots when doing land scape photo's, works great for car photography as well. I do want to go back for a morning or evening session, it is an easy stop on the way to where I make my tuning runs which I will be doing again in the next day or two.